The Glass City Dog Park will be holding a Community Open House on May 18, 2019 from 9 AM to 1 PM. Vendors will receive a designated spot in the area directly outside the park. Vendors will also be included in social media posts and may also contribute to a welcome packet for new members (not required). Vendor names and logos will be included on Social Media organic posts, in the new member welcome packet, and the Glass City Dog Park website. Vendors will need to be set up by 8:45 AM. Vendors must provide tables and any other set up. The small vendor fee of $20 will be used towards sponsored ads to promote the event. Glass City Dog Park will be hosting a Community Open House where anyone interested in becoming a member can try out the park for free before they purchase a membership. Visitors will be asked to sign a waiver of liability, show proof of current vaccinations and that their dog has been spayed or neutered. Come out and see how much fun the dog park is for pets and owners alike! We will also have vendors and lots of fun for current members! 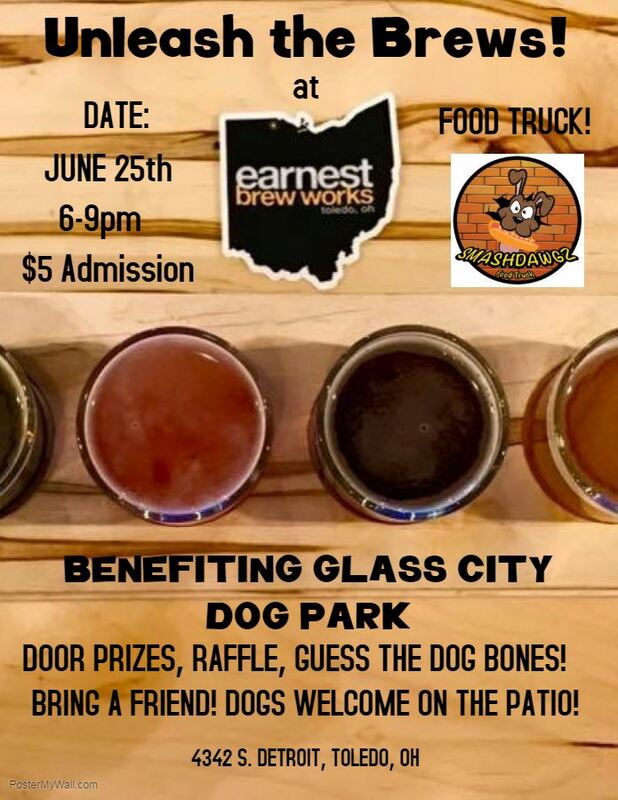 Join us for a fun night drinking pints of beer at Earnest Brew Works! There will be flavored beers all brewed on site with a portion of sales going to the BEST off-leash dog park in Toledo! We will have a door prize drawing for all in attendance, a 50/50 raffle and "guess how many dog bones" contest. Smashdawgz food truck on site if you are hungry, but we hope you also come THIRSTY for some pints! Bring some friends and see you there!! April 13, 2019 Easter Egg Hunt! February 02, 2019 Ground Dog Day! December 02, 2018 Photos with Santa! March 24, 2018 Easter Egg Hunt! March 01, 2018 Unleash the Corks!! December 03, 2017 Photos with Santa! June 17, 2017 OPEN HOUSE AT THE DOG PARK! April 22, 2017 Spring Clean up at the park! April 08, 2017 Doggie Easter egg hunt! September 24, 2016 GCDP 2nd Birthday Party! September 27, 2015 GCDP Birthday Party!!! !